Our recent trip to New England was a whirlwind of culinary delights, and one of the highlights was visiting a fabulous recipe in Boston called Sportello, recommended by an old friend of David’s. 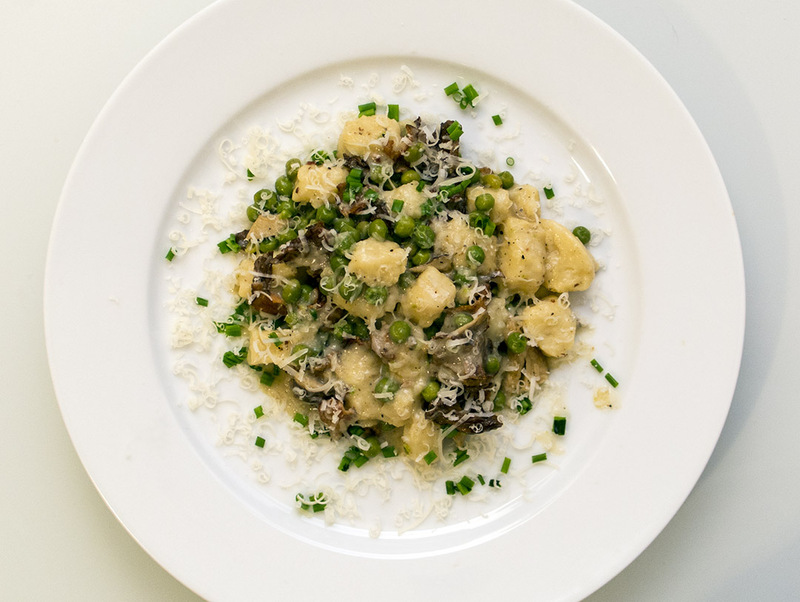 Our meals were outstanding, and I particularly enjoyed my dish, which was potato gnocchi with a mushroom ragu, peas and cream. The gnocchi was just divine–melt-in-your-mouth good–and so upon our return, we were inspired to try our hand at making gnocchi from scratch ourselves. I’d read several descriptions of the gnocchi-making process as being somewhat temperamental, with dangers of them turning out chewy, bland or dense, but we were determined to give it a go. Bring 2 pots, 1 large and 1 medium, with well-salted water to a boil over medium heat. Set up a bowl of well-salted ice water. Blanch the fresh peas in the medium pot of boiling water until they are cooked but still crunchy and then immediately plunge them into the salted ice water. Remove them from the ice water and reserve. Coat a large saute pan over medium heat with olive oil. Add the smashed garlic cloves and crushed red pepper and bring the pan to medium-high heat. When the garlic has become golden brown, remove and discard it. Add the prosciutto and sauté until it starts to get crispy, 1 to 2 minutes. Add the mushrooms and season with salt. Sauté for 3 to 4 minutes. Add the peas and chicken stock and season to taste. Simmer until the stock has reduced by about half.While the stock is reducing, add the gnocchi to the large pot of salted boiling water. Cook the gnocchi until they float and get very puffy. While the gnocchi is in the boiling water, add the butter to the pan with the mushroom mixture. Cook over low heat and swirl to incorporate. When the gnocchi are cooked, carefully remove them from the cooking water and add them to the pan with the mushrooms. Toss or stir to combine. Cook the gnocchi with mushroom mixture until it clings to the gnocchi. Add the grated Parmigiano and the chopped chives. Transfer to serving bowls and serve immediately. Bake the potatoes until they are fork tender, about 45 minutes to 1 hour. While the potatoes are still hot, scoop out the potato flesh and pass them through a food mill or ricer onto a sheet tray lined with parchment paper. When doing this, pay careful attention to keep the potatoes as light and fluffy as possible, as this will aid in keeping the gnocchi light. Refrigerate the potatoes on the sheet tray until cold. When the potatoes are absolutely cold, transfer to a clean work surface. Beat together the eggs and cheese and pour onto the potatoes. Season with salt. Cover generously with flour. Crumble the potato flour mixture between your fingers. Begin to knead the dough until it is a dry homogeneous mixture. The dough should feel slightly moist, but not tacky. If too tacky, add additional flour. Form the dough into a large log. Cut slices off the log and begin to roll into long ropes that are about 1″ in thickness. Cut the ropes into ½” lengths. Cover generously with flour. Place the gnocchi in a single layer on a sheet tray dusted with flour, being careful not to pile them on top of each other. Use or freeze the gnocchi immediately. If freezing, place tray directly into the freezer. Once frozen, the gnocchi can be stored in plastic bags, in the freezer, indefinitely. When cooking gnocchi they can go directly from the freezer into salted boiling water. A few notes on preparation: We didn’t have prosciutto, so we substituted just shy of a ¼ lb of sliced bacon. We also used a combination of fresh shiitake mushrooms and dried chanterelle mushrooms (re-hydrated). We forgot to add a pinch of red pepper flakes. David also mixed in about ¼ cup of heavy cream to the sauce while it was reducing. In making the gnocchi, I used 2 cups of flour on top of the potato initially, and probably an additional ¾ cup when working with the dough and flouring the surfaces. Given that many descriptions of making gnocchi had warned us to not expect our first try at it to be perfect, we were both pleasantly surprised at how tasty our gnocchi actually turned out to be. This particular recipe was termed “Light as a Cloud Gnocchi”, which I thought was promising, and indeed, they succeeded in having a lovely, light, creamy texture. Perhaps the only improvement would be cooking them a touch longer, so they might get even puffier and adding a bit more salt to the boiling water. The sauce was also quite lovely, though we did muse on ways we could improve it. We noted that we could probably cut the amount of peas in half and add them into the sauce mixture at the very end, as they were a little bit soft for David’s taste. We would use fresh mushrooms next time, as dried mushrooms never seem to have the right texture. Though the sauce coated the gnocchi quite nicely, we both noted that a touch more actual sauce would be nice, so perhaps not reducing quite as much or adding a bit more stock to begin with. All in all, a definite success! Plus, we made a full recipe of gnocchi, so we have lots leftover to have for other meals. Calling it a win!